"And America is Now Blood and Tears Instead of Milk and Honey." That above statement is a quote from, "Who Will Survive in America?" the last song on Kanye West's "My Beautiful, Dark, Twisted Fantasy" where he sampled Gil Scott-Heron. 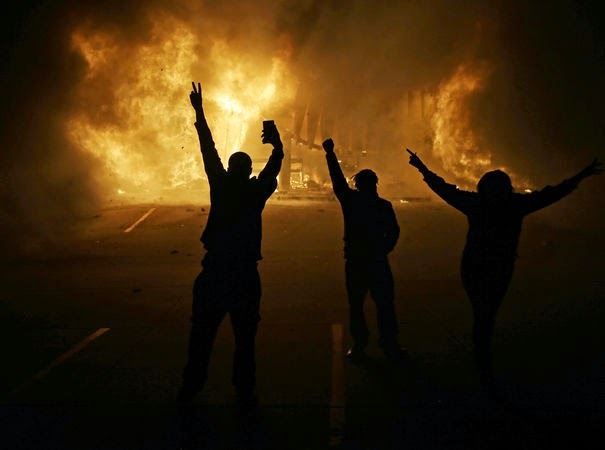 It sums up how many may feel about America after it was announced that a grand jury had decided not to indict officer Darren Wilson for the shooting of Michael Brown. 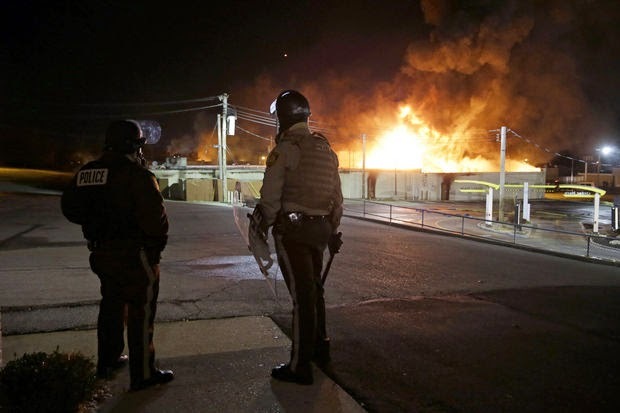 There was grief, people got mad, and Ferguson literally burned. I wasn't surprised by the verdict, and having not heard all the evidence I am unsure if I could say he should have been indicted (although some articles say indicting a police officer is all-but-impossible). I can say I am absolutely positive that I had hoped Saint Louis and the surrounding areas would react calmly and peacefully regardless of what the decision was. That of course did not happen and last night rioting ensued. Undoubtedly some people were legitimately trying to protest the jury's decision peacefully, other people just wanted to loot and set fires, and many folk fell in various spots of that spectrum. 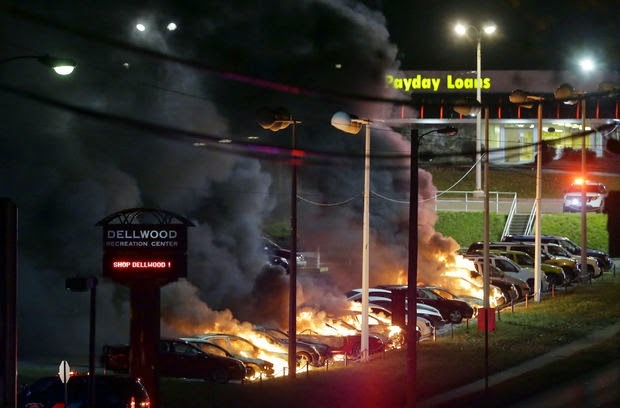 It was a night worse than anything witnessed in August (when some rioting last occurred), and I watched with sadness as a crowd of people angry at the verdict began rocking police cars, breaking windows, and eventually burning businesses to the ground. There is so much rage, so much anger, and I along with no one else has a good solution. Well, I do have a solution, but it won't happen. It is that we as a society move past race and instead value each other as human beings regardless of the color of our skin or income-status. That taking place anytime soon is about as likely to happen as meatballs raining from the sky however, so instead our nation will continue to struggle with racial tension, economic tension, and basically any form of tension you can think of that pulls people apart instead of bringing them together. 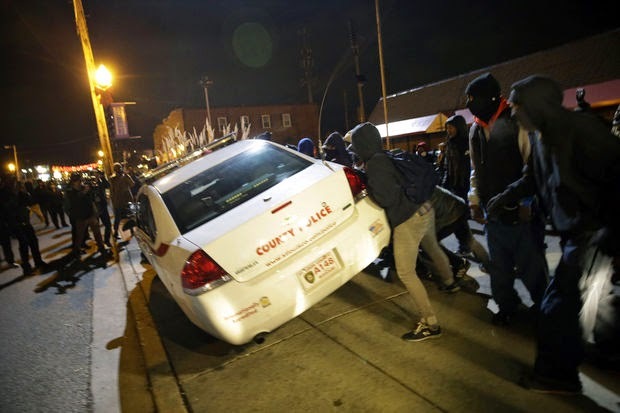 For days, weeks, months, and probably even years there will be media scrutiny about what happened last night--why Wilson wasn't indicted, if a Federal case could occur, if the rioting was warranted--but I have nothing else to say and plan on having this be my only statement about what happened last night. I have nothing else to say because as a white person I honestly can not imagine what it is like to be a black man in America, facing the profiling and persecution my friends of color deal with every single day. Being Jewish I've faced some hatred in my life, but never at the level I witness towards anyone whose skin color happens to be anything other than white. 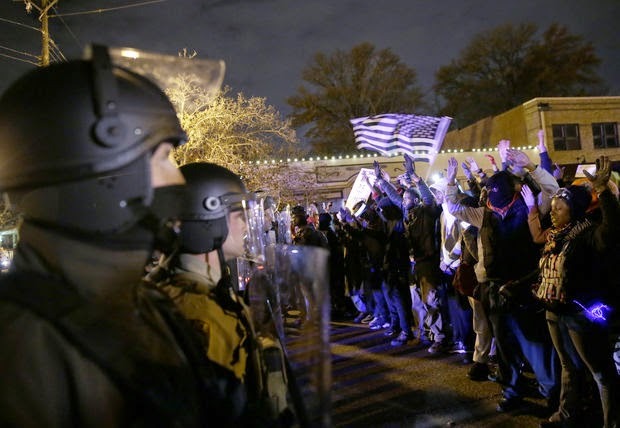 So yes, all I have to say is that it saddens me that so much anger was evident last night, and that rioting occurred. I don't know what will happen tonight but hope for less violence. I also am trying to see where the rage comes from but due to my position of privilege I was born with I probably will never truly understand. I just hope something positive can come from all of this--that a dialogue can finally start in this nation about race. I truly do hope for such a thing, but if history has shown us anything it is that America has a long and painful racial history, and it isn't one that is going to be, "fixed," anytime soon. I can keep hoping though, right?